There are a number of theories as to where the popular game of craps came from, however, there is no definitive answer that can be found, and it is likely to be one of the biggest gambling game mysteries around. It is clear that the game has similarities to other gambling games that were played in the 17th century, such as the game hazard, but it is not agreed upon by all that hazard is the origin of modern day craps. There are those who are convinced that the game was played by knights, and their leader, Sir William Tyre as long ago as the crusades. In fact, many believe that the game may have been invented by these knights while they were looking for distractions when they had a castle under siege in the year 1125 AD. It seems that the name of the castle in question was either Asart or Hazarth, and that is perhaps where the name Hazard came from. Another theory is given by the Encyclopedia Britannica that claims that the Arabic words that are used for dice, ‘azzah’ or ‘al zar’ is where the name of the game hazard comes from. Whichever of these theories may hold the truth, it does seem clear and agreed by all that the game is similar to the game hazard. In the 17th century, the game hazard rose in popularity in some circles of Englishmen. In fact, the game is even mentioned in Geoffrey Chaucer’s Canterbury Tales. Gambling houses that offered games to only the higher class English noblemen used to offer this as one of the gambling games in the 17th century. Montmort is credited with having shaped the formal rules of the game of hazard at this time. 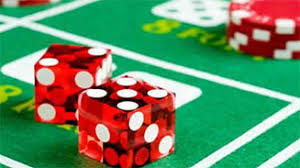 Some are of the opinion that the name of the game was changed from hazard to craps by the French, although others believe that this change took place in America. In the game of hazard, if a player throws the number 2, a losing number, it is called ‘crabs.’ While the French have been known to say that they changed the ‘crabs’ to ‘craps,’ others say that the English used the name ‘craps, and that the French changed the name to ‘crabes’ to make it sound more French. There has been some evidence that dice games were played in Egypt where cubical dice were found and were dated to at least 2,600 years old. There are also connections to dice games in the Arabic world and in the Roman Empire, where both Caligula and Caesar where known to play dice. Whatever the origins of this exciting casino game, it is enjoyed today by players in both land based casinos and in online casinos.